Written by: Jane Goldman and (based on the novel “Dan Leno and the Limehouse Golem”) Peter Ackroyd. We have a constant fascination with the crimes committed by Jack The Ripper but did you know that there was a similar serial killer roaming the streets of London at the same time? This is the basis of a new British film, The Limehouse Golem, a gothic horror based on murders that occurred in the East End of London that inspired Peter Ackroyd’s best selling novel, Dan Leno and the Limehouse Golem. It is a film that captures the darkness and grime of London during the Victorian area, particularly the music hall scene and is filled with top notch performances from a terrific cast. Shame that the film lacks any real emotional punch. Inspector John Kildare has been promoted to investigate a series of grisly murders committed by a character known as The Limehouse Golem. At the same time, Elizabeth Cree, a music hall star, is in the middle of a court case, accused of murdering her husband. As Kildare digs deeper in the evidence of the murders, four men come to the forefront after visiting the British Library, it becomes apparent that the Golem is linked in some way with Elizabeth’s case. The further Kildare investigates, the closer it is bringing him to Elizabeth and, it seems, further away from the case he is working on. Juan Carlos Medina’s film, with a script by Jane Goldman, is a masterpiece of gothic London. It captures the mood and grime appearances with great aplomb. the production values are extremely high, from the darkened alleyways and dirty-ridden streets of East London to the noise and bustle of the Victorian Music Hall. Here the film scores big, reminding us that the theatre was a place for the poor, all longing for rude humour and grim tales of murder and death. Where the film struggles are the emotional depth of the characters. using flashbacks and imaginary scenarios to tell the tale of this investigation as well as recalling the events of Elizabeth Cree’s accused crime, somehow detaches us from caring about the people involved. We get sequences where the men under suspicion are seen walking through each murder, as they narrate their versions of events, a technique that is similar to those used in Sherlock but here they fail to really work and so keeps us from arm’s length from really caring about who did commit the crimes. The performances from a strong British cast are, as you would expect, excellent. 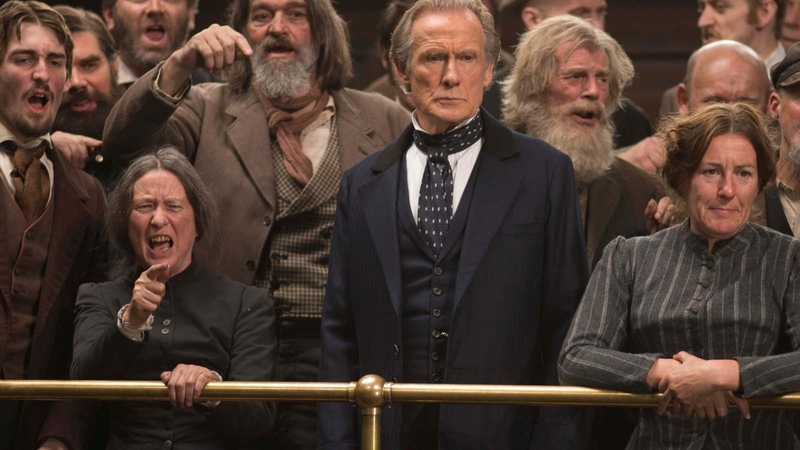 Bill Nighy, taking on the role of Kildare that was originally intended for the late Alan Rickman, is quietly underplayed. What isn’t made clear is his past, in which, we are told, that he is not “the marrying kind” but this is never fully explored and so you wonder why it was brought up in the first place. Nighy’s partner, a constable played by Daniel Mays, make for some interesting and often intense scenes, as May’s character realises that Kildare may be more interested in the Music Hall star than the crime he is working on. Douglas Booth as Dan Leno, is the weakest of the performances, playing his character like a bizarre variation of Russell Brand, while the excellent Edie Marsden is given little to do as Uncle, the man in charge of the Music Hall who has a dark secret. 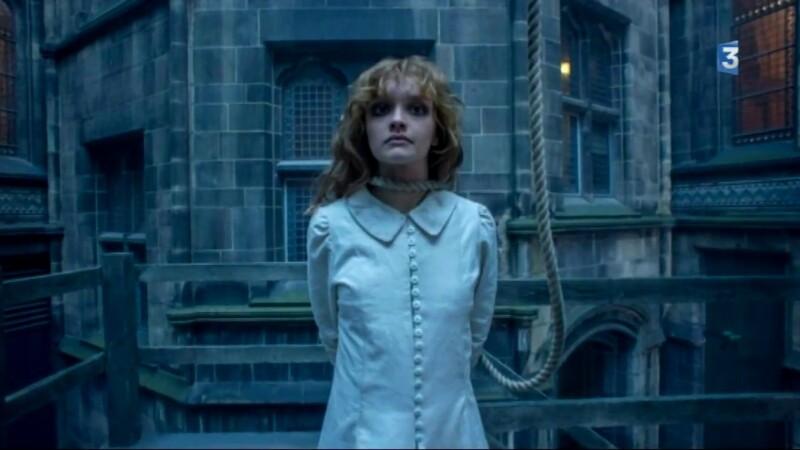 The real star performance is Olivia Cooke as Elizabeth, a woman who has to cope with facing the hangman’s noose, while, shown in flashback, we get to see Elizabeth’s tormented and troubled life until the day she hits the big time as a popular star of the stage. It’s a complex and powerful performance and should propel her to superstardom. The Limehouse Golem isn’t a terrible film by a long shot. It is a feast for the eye and it’s always a joy to watch a talented cast working hard. It just needed to be more disciplined in its depiction of the whodunit, something I worked out within the first few minutes. I just wanted it to be far more engrossing and far more emotional than what I got.